I frequently find myself disappointed by my personal attachment to mascara, foundation, and eyeliner; preferring to imagine how liberated I would feel if I had the confidence to never wear make-up, never need make-up to complete what has now become my ‘normal’, ‘everyday’ look. I am not, by any length the only girl who would say she feels naked without make-up on. I try to visualise the freedom I would feel un-mascaraed and on public transport, but all I can think about is that I would look like a mole, with tiny eyes and a squinting, lash-less, fearful stare. It frustrates me that I can’t even envisage emancipation without superficial trepidation. And herein lays the issue: no matter how much I like the idea of my make-up being unwillingly removed from me, or the time I spend on make-up being taken away for use on something more useful, I would in reality become untethered, exposed, and vulnerable by such a change. No matter how artificial I know make-up can be, it is also, to fulfil the cliché, a suit of armour and a hobby that is at once habitual, exotic and exciting. I have grown up in a society where make-up is readily available from the moment a girl has money readily available to spend on it. However much we may want to use it less or look more natural, it will never be for lack of obtainable purchases that we end up doing so. Whatever the fancy or occasion, there is a product to suit my needs. Even the words I use to describe making-up – ‘imperfection’, ‘enhance’, ‘feature’, ‘natural’, leave me sounding like a seasoned department store beautician. I am an avid subscriber to this make-up culture. The women of Tohoku, a vast area of northern Japan levelled by the earthquake and tsunami, now named ‘March 11’, also subscribers to this make-up culture, have been stripped bare in every sense, by this catastrophe. Of course, the circumstances of every family differ depending on the will of the enormous wave and what was swept up in its path. What is certain is that thousands of families continue to live in temporary housing with little or nothing left of their own homes remaining, and either donated or newly purchased clothing, household goods and furniture. Though clean-up operations are at maximum activity, and though many are attempting to get back to a semblance of normality as soon as possible through work and school, many only have to look across the road to be reminded by mountains of collected rubbish – large enough to contain whole cars, walls of peeling paint, uprooted cement curbs, dangling telephone lines, and so on, of the enormous task of reconstruction to come in the following years. It is a situation in which words like ‘endurance’, ‘resilience’ and ‘perseverance’ simultaneously play out their real meanings, and fail to capture the tortured attitude of the people who live there. I was the last person to believe that make-up could play a useful and productive role in the healing process occurring in these areas. I was more than sceptical when I heard about a charity that visits temporary housing (grim prefab-esque sheds that match the sombre mood with grey sheeted monotony), doing community work with women from Tohoku by collecting groups of hair and make-up professionals together in Tokyo, taking them to Tohoku, and giving makeovers, massages, manicures and a blow dry to locals. I scoffed at what I felt was a shallow attempt at re-building women’s lives from the most gender-stereotyped position conceivable, at least the women’s groups who were up there sewing and crocheting handkerchiefs were selling them and creating a local economy, I sneered. 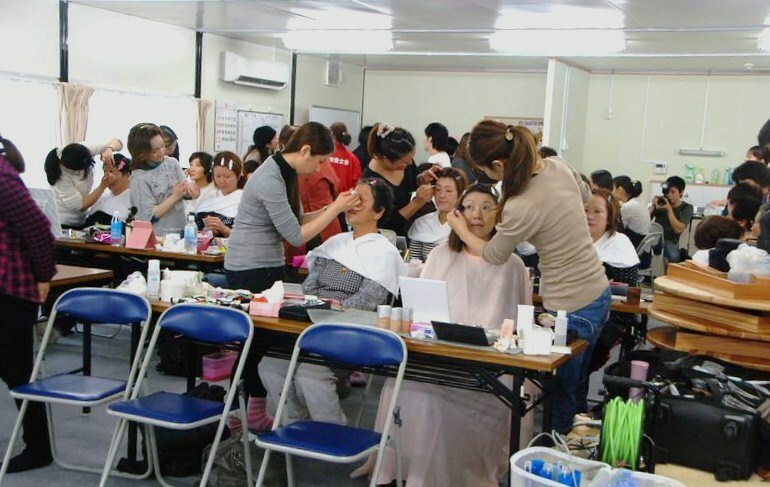 I can only attempt to appease for these rash conclusions, by describing the real benefits and happiness that this charity, Tokyo de Volunteer, brings to the women of Tohoku who participate in makeover days. As we arrived on our coach from Tokyo (supplied for free by a chartered bus company), and pulled up in grey, icy rain to the pre-fab car park, that was about to fill with a stretch of rain water to rival an inland sea, I saw that the first users of the charity services were already queuing up at the community room’s locked doors. Hunched old ladies chatted gaily, arms folded, aprons on, pleased to have got themselves first on the list for treatments. The charity leader told me that the event had been advertised for a week, and that everyone would have been waiting for our arrival – nothing like this ever happened here. Within minutes, while we set up the tables and arranged make-up stations, the room filled with cacophonous voices, young and old, children, mothers, wives and girlfriends. They were women who were unlikely to have had time to mix as much as they would like with one another, looking after the family in Japan is full-time employment; and looking after the family while you inhabit a plastic shed, try to encourage your children to play normally from a room that looks on to a gravel hillside, get your husband back into work without a car to drive to work in, and magic an inspiring dinner out of limited and dubious quality ingredients; is a recipe for isolation from friends and neighbours for these women. Every visitor in the room took the load off their feet, closed their eyes, and allowed themselves to direct a conversation in whichever way they wanted. They could talk about their beauty regime, the shapes of their faces, the things they had to do that day, the things they were doing the day that the tsunami struck. Above all, I was struck by the power of touch, although it is too much of a generalisation to say that Japanese people touch each other less than we do in Europe, there is a clear difference in the way that they physically interact. Yet, the nature of what TdV does, allows women, strangers to one another to touch in a comforting, healing way. Knowing that beauty in Japan is a multi-million yen industry with a strong hold on both men and women – many finding comfort and at least a routine in make-up and styling, I can only imagine that being exposed materially by the events of March 2011 and deprived of private time, means that women are struggling to screen their strife behind completely naked faces. For most people a modicum of maintaining ‘appearances’, and looking a little like one’s house is in order is what gets us through hard times. 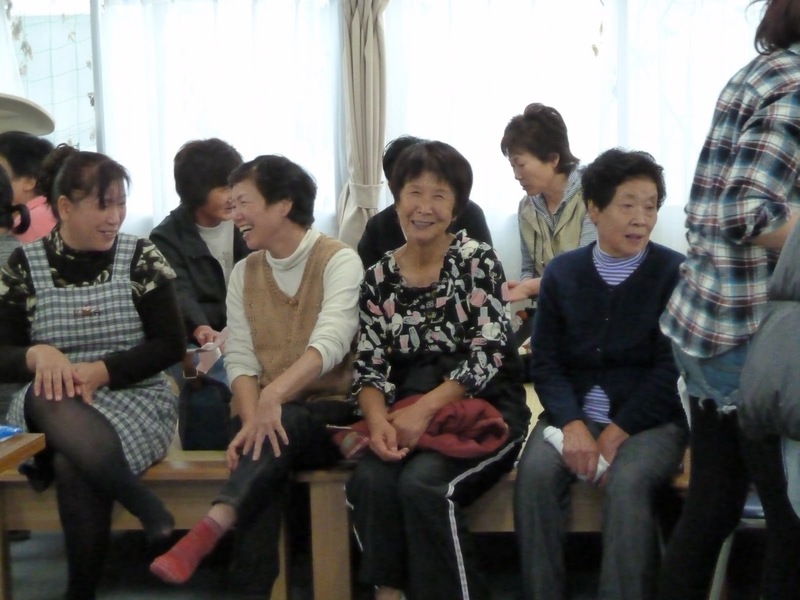 The days that TdV puts on in Tohoku are not only fun, communal, and an alternative to the other charity projects in operation, they also reinvigorate the women visited with self-confidence and renewed self-worth. Whether it is right or not that we live in societies where make-up gives us strength and makes us feel better in our own skin, I felt on these visits that it at least gave these women an opportunity to put on a brave face at a time of extreme despair. 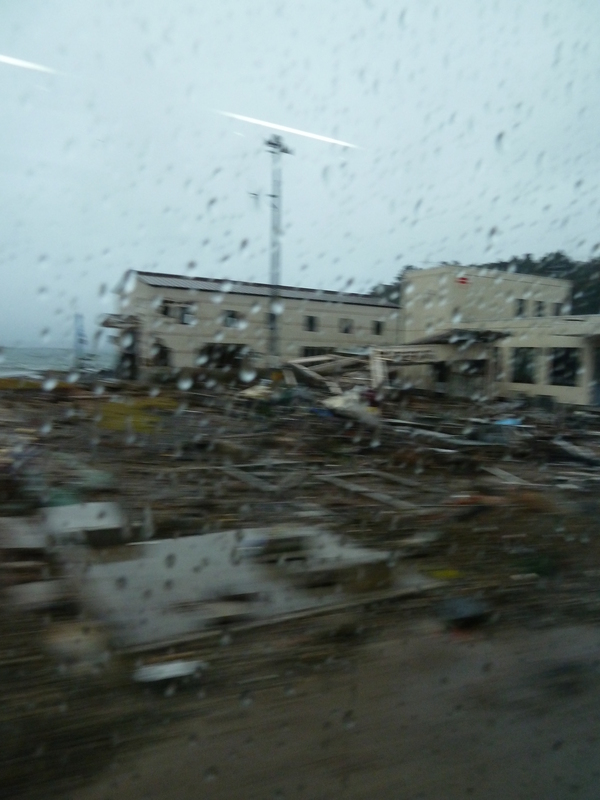 This entry was posted in Uncategorized and tagged charity, make-up, northern japan, Tohoku, volunteer, women by immaterialme. Bookmark the permalink.